I came back to Bristol this week from a short break in London after managing to bag a £1 room at the rather lovely Hoxton hotel in their pound sale (did I mention that I hold the title of Queen of Bargains?). Exploring the local area, we headed for boutiquey, hipster-esque Spitalfields Market, perusing the cute dresses, jewellery and some rather fetching, uncannily similar, Cath Kidston-esque floral messenger bags (one of which I sadly didn’t nab and am now mourning). The eternal tourists, since we were in the area we wandered toward Brick Lane. 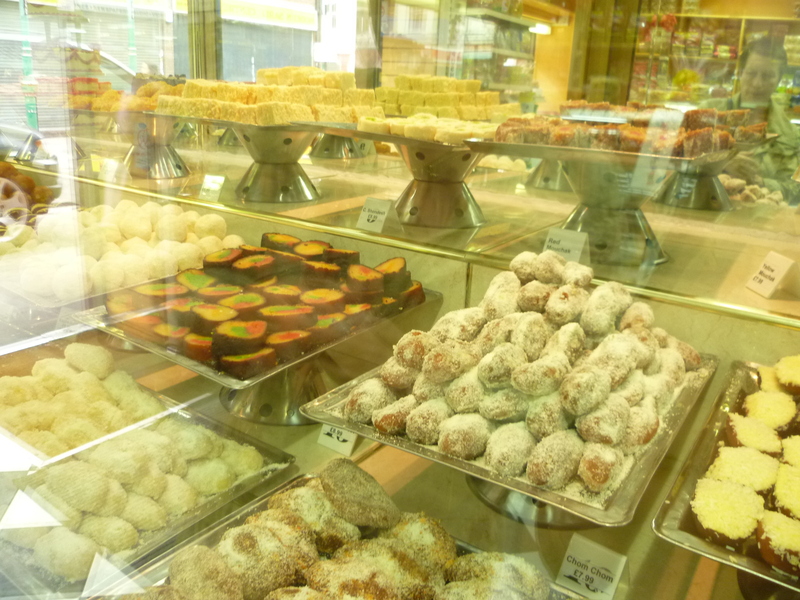 I loved taking in the air, infused with a vast array of aromatic spices that seem to wrap around you and pull you toward windows, filled with everything from pakoras to beautiful pistachio-sprinkled pastries and over-the-top tier cakes with extravagent coloured piped frosting. With achey feet, we wandered towards the hotel and I spotted something that instantly brought a huge smile to my face – a sign pointing to The Hummingbird Bakery. If it’s possible, I felt a bit cake-struck (like being starstruck, but by amazing cakes). I, like many, have the book and dip into it regularly with yummy results. I was desperate to try the real thing and compare it to my own efforts. I loved the styling, layout, and feel of the place. 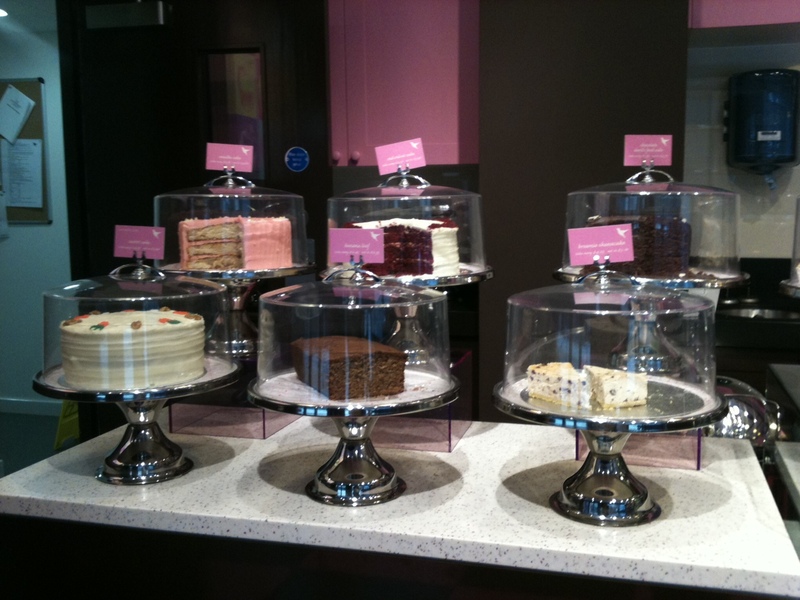 It’s classy, colourful and chic – the perfect atmosphere for indulging a sweet tooth. And I’ve got a whole mouth of them. After much to-ing and fro-ing, we went for a rather large slice of the Red Velvet cake (always good to try out a contemporary classic) and a carrot cake cupcake – mainly because you have to spend £5 on a card, and a slice is £4.60 to take out, very crafty! The Red Velvet was a generous, beautifully burgundy, triple-layered slice, with fluffy, moist sponge, topped with a super-sweet cream cheese frosting, typifying the classic American style of baking. The frosting was possibly a little too sweet for me, but I wholeheartedly (and quickly) enjoyed it. The carrot cake cupcake arrived in the cutest little box I think I’ve ever seen, complete with tiny metal carry-handle. Not very environmentally-friendly, but it certainly added to the premium feel (and no doubt partially explained the premium price tag). Again, it was beautifully moist and light, with hints of cinnamon, a perfectly matched frosting, and an individual walnut to finish. A great thing that I took away from my visit – aside from two gorgeous pieces of cake – was a reassurance that the book was actually pretty true to the real thing, and that the cakes I’ve made myself weren’t far off the quality and taste of those produced at Hummingbird. A really wonderful feeling. So I’m off to peruse the book, drool a little, and figure out what treats I’ll be whisking up in the near future. 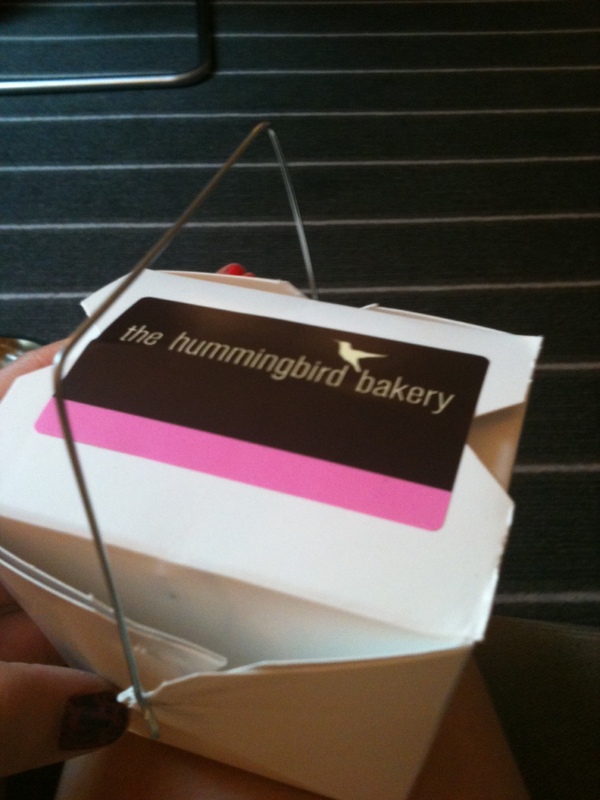 If you’re a Hummingbird fan too, what have been your favourite things to bake?